Announcing our launch party to celebrate Writing Ourselves Whole! Posted on November 5, 2017 | Comments Off on Announcing our launch party to celebrate Writing Ourselves Whole! Please help us to spread the word – the Writing Ourselves Whole is finally getting its launch party! If you’re in the SF Bay Area, I’d love to have you join us for a night to celebrate the power of writing as a practice of resistance and healing for sexual trauma survivors. At a time of daily challenging conversation about sexual violence in our society, join Jen and the Writing Ourselves Whole community to celebrate the release of her book, Writing Ourselves Whole: Using the Power of Your Own Creativity to Recover and Heal from Sexual Trauma (Mango, 2017). The evening will include a reading, Q&A with a special guest, and book signing — plus books for sale on site. We will have light refreshments (including some homemade baked goods!) and drinks. 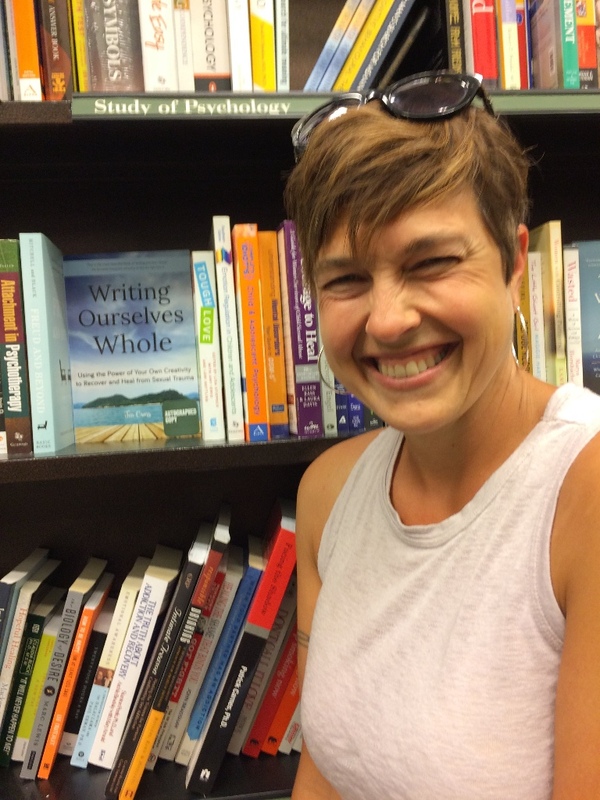 In her book, Jen brings a message of hope and possibility about the power of creativity and writing in community as a path to transformative healing and personal liberation. Writing Ourselves Whole is full of support and advice for anyone who wants to tap into their creativity as a means to grow and heal. Writing Ourselves Whole is a book about power and possibility, hope and transformation, and expertly weaves anecdotes from Jen’s own journey of self-exploration and recovery through writing with rich guidance and encouragement garnered from her fifteen-year career leading writing groups in the SF Bay area and around the country. She has experienced and witnessed first-hand the power of writing – alone and in creative community – to manifest transformative change in the lives of those who embrace its possibilities. Comments Off on Announcing our launch party to celebrate Writing Ourselves Whole! 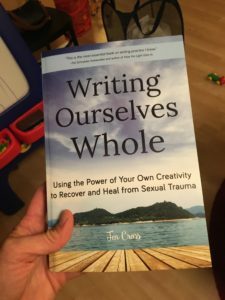 Posted on August 31, 2017 | Comments Off on #WritingOurselvesWholeBook has arrived! The picture my sister texted when she received her copy of Writing Ourselves Whole in the mail! It’s how I knew the book was out in the world! We’ve reached that beautiful moment in the SF Bay area when the light begins to change, school gets going again, the leaves on our few deciduous trees start to change color and fall — and suddenly summer arrives in the Bay Area. I hope you are enjoying this warm weather — and staying cool and hydrated in the places where it’s been extra hot. Jen smiles big next to the Writing Ourselves Whole book on a bookstore’s shelves! If you have or are already reading the book, I so hope you enjoy it, are inspired to write, and then share it with friends, pass it around, maybe even start a survivors writing circle of your own. Thank you for your words today, and every day. Comments Off on #WritingOurselvesWholeBook has arrived! The Icarus Project in Vancouver – this week! Posted on March 30, 2011 | Comments Off on The Icarus Project in Vancouver – this week! 4 Icarus Project Workshops – This Week! Radical Mental Health in People of Color Organizing Communities – TODAY! Note: This workshop is intended as a safe(r) space for people of color and has limited space, please RSVP. This will be a facilitated discussion around the issues and challenges that people of color experience in common when faced with addressing mental health concerns in their communities. The discussion is intended for people of color, and will be focused on drawing out the experiences of the group with the goals of sharing strategies and resources for radical mental health. The discussion will be facilitated by Kiran Nigam (AORTA, The Icarus Project) and Anthony Meza-Wilson. Space will be limited to 20 participants, please RSVP to: anthony.mezawilson@gmail.com. La Bicyclette Rouge is not wheelchair accessible. There are approximately 10 stairs with a banister. Washrooms are standard, single occupant washrooms with minimal clearance and no rails. Please no strong or artificial scents. A radical community discussion of the intersections between queer and trans lives and experiences of emotional distress, “mental illness,” and healing, facilitated by Jacks McNamara (Icarus Project) and Kiran Nigam (AORTA). In this workshop we will open space for creative investigations of queer/trans experiences with mental health that inspire us to break isolation, find our stories reflected, share strategies towards healing, a…nd build community resilience in the face of a shaming, crazy-making world. Feel free to distribute widely and share with friends. Please minimize the use of artificial scents & perfumes. 11:30 am – 2:30 pm, Saturday April 2. What structures can we put in place to help prevent crisis situations from occurring, or min…imize their potentially negative impact on the community when they do occur? What can we do for our friends in times of extreme crisis to keep them from either getting locked up or hurting themselves? What can we do after wards to help everyone heal? How can we minimize feelings of alienation, anger, sadness, insecurity, etc. and create communities that foster self-determination and support us all? Using a popular education framework, we will explore these key questions together. We will also learn about what a Mad Map/ Wellness Map is and make our own maps to share with our friends and loved ones. 3:30 pm – 6:30 pm, Saturday April 2. How do privilege, oppression and collective liberation relate to radical mental health? How can we create communities that support our mental and emotional health as activists? Does the undertaking of collective liberation recognize diversity in mental health experience? Problematic binary definitions of mental health experience (you’re either “normal” or “crazy”) are rampant in mainstream culture. The Icarus Project recognizes …the multiplicities of mental health experience and strives to create a community that regards the range of diversity as something to be respected and even rejoiced in. In this workshop, we will explore ways to promote safer spaces in our communities. We’ll discuss the importance of sharing our personal stories, giving and receiving support, and building communities that are truly welcoming to all marginalized people. Using exercises like “Mad-Mapping” and skill-sharing, we’ll collaboratively envision structures for mental and emotional support, and dialogue about why such strategies are vital to collective liberation. The DIY Dharma spaces is wheelchair accessible. Comments Off on The Icarus Project in Vancouver – this week! RAFAEL CAMPO, M.A., M.D., D. Litt., is a poet and essayist who teaches and practices internal medicine at Harvard Medical School and Beth Israel Deaconess Medical Center in Boston. He is also on the faculty of Lesley University’s Creative Writing MFA Program. He is the recipient of numerous honors and awards, including a Guggenheim fellowship, a National Poetry Series award, and a Lambda Literary Award for his poetry; his third collection of poetry, Diva (Duke University Press, 2000), was a finalist for the National Book Critics Circle Award, and his most recent, The Enemy, won the Sheila Motton Book Award from the New England Poetry Club, one of the nation’s oldest poetry organizations. His work has also been selected for inclusion in the Best American Poetry and Pushcart Prize anthologies, and has appeared in numerous prominent periodicals including The Nation, The NewRepublic, the New York Times Magazine, Paris Review, Salon.com, Slate.com., and the Washington Post Book World. Rounds begin at 5:00 followed by refreshments. Free and open to the public.